The things we leave behind, or set apart, are usually left behind or set apart because they serve a purpose different from the one we have currently in mind. A walk around Santiago’s La Vega and Central markets yesterday morning, followed by a stroll in the Yungay district confirmed this notion. An illuminating and educational way of passing the morning before the arduous business of attending the city’s annual book fair. 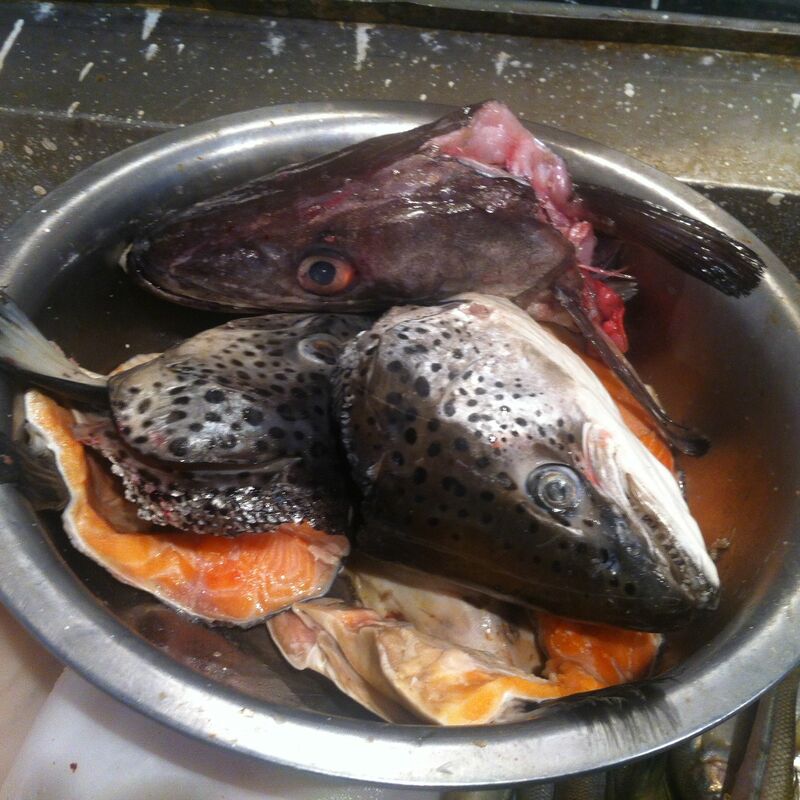 Fish heads are left behind because people often feel as though they are not intrinsic to the preparation and cooking of said fish, since, unless they are very small fish, the heads are unlikely to be eaten. However this does not take into consideration the aesthetic qualities of presentation. If you are going to bake a large fish and place it on a serving dish in the middle of a table, you want it with its head attached, surely? Many people, nevertheless, leave their fish heads with the fishmonger, who will display them in a basin or bucket. 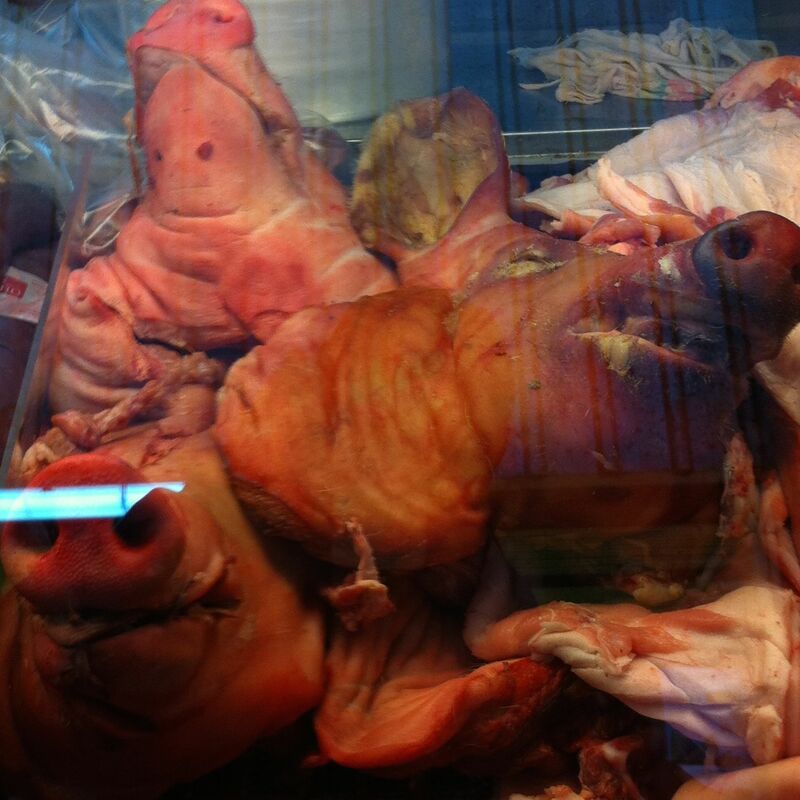 Pigs have been known to lose their heads. Or, put another way, the heads get left behind in the general process of butchery. The three unfortunate specimens in this photograph, snouts pressed up against the glass of their cold grave, are sad examples of human carnivorousness. But if the situation were reversed, and pigs were left in charge, would humans fare any better? If the HBO series Deadwood is any guide, decidedly not. 3. Someone seems to have left a backpack filled with dead chickens on the pavement. 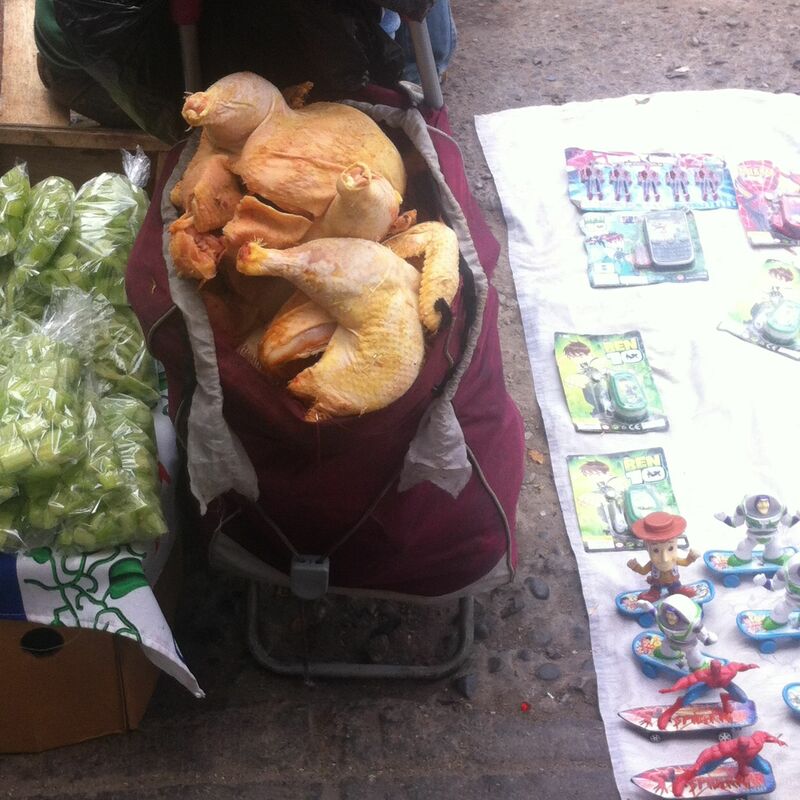 This questionable practice is apparently an acceptable way to dispose of one’s unwanted chickens in Santiago. 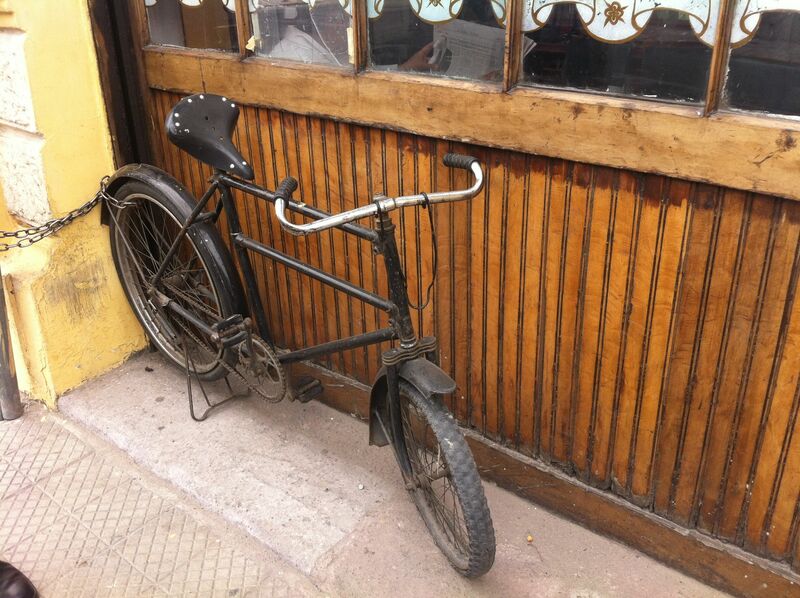 Bicycles are left outside the barber’s or the restaurant as they would be an encumbrance inside. There would be no space. However, they are far more likely to be stolen if left outside. Therefore their owners attach the bicycle to a fixed object by the use of a chain or similar locking device. 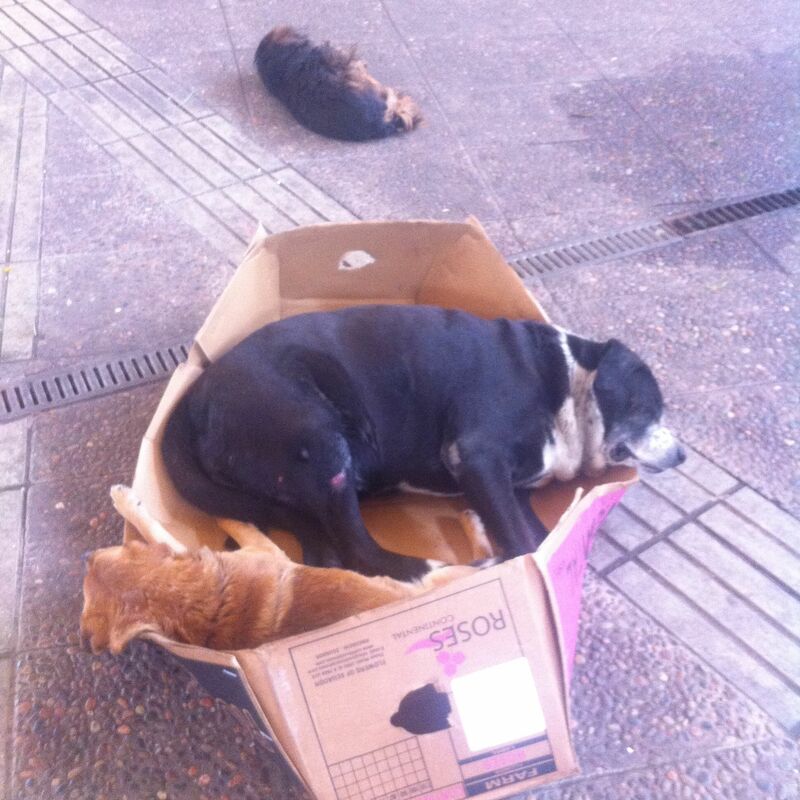 A cardboard box, once used for the packaging of roses, is left out in the flower market, and provides a handy resting place for a couple of market dogs. Dogs, it should be noted, are everywhere in Santiago de Chile. They are often quite large specimens, such as the black one here, and roam the streets with a marked sense of propriety. People appear to be generally indulgent of them, and consequently the dogs are a constant presence: a Santiago street scene is not complete without a canine in view. 5a. Sometimes a clever street dog overcomes the lack of manual dexterity that affects species without an opposable thumb, and learns to paint. 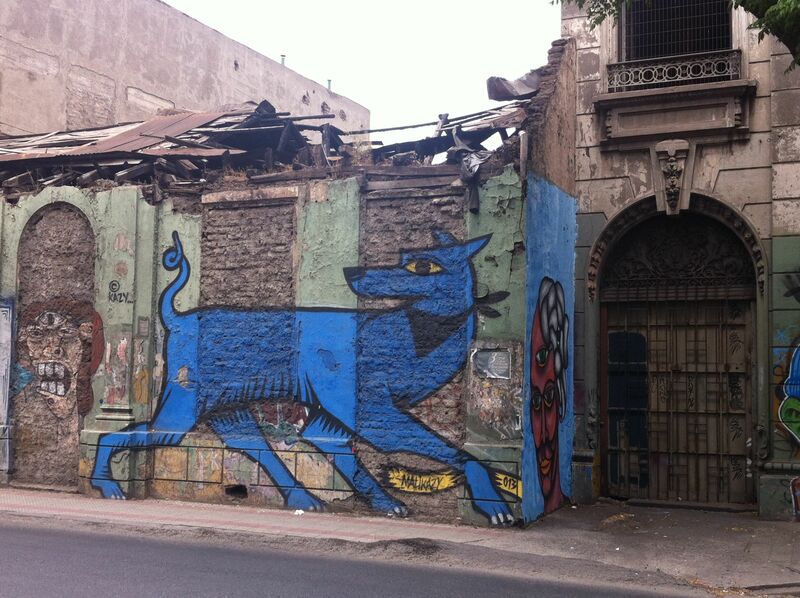 Below is a self portrait by ‘Blue Dog’, in the barrio of Yungay. 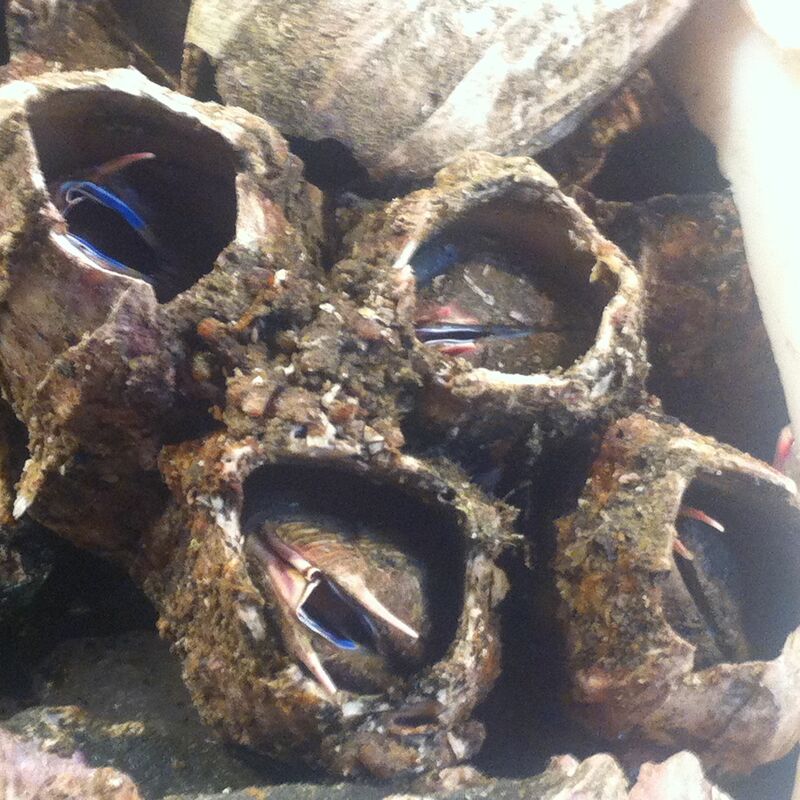 Back in the fish market, I discover the most bizarre species of seafood I have yet encountered: picorocos. They are pictured below, their little claws gesturing feebly in the blind air. They live inside their tunnel-like log homes (not logs, but crumbly rocks), and they wait. They wait, their little claws gesturing blindly in the empty air. And they wait . . . 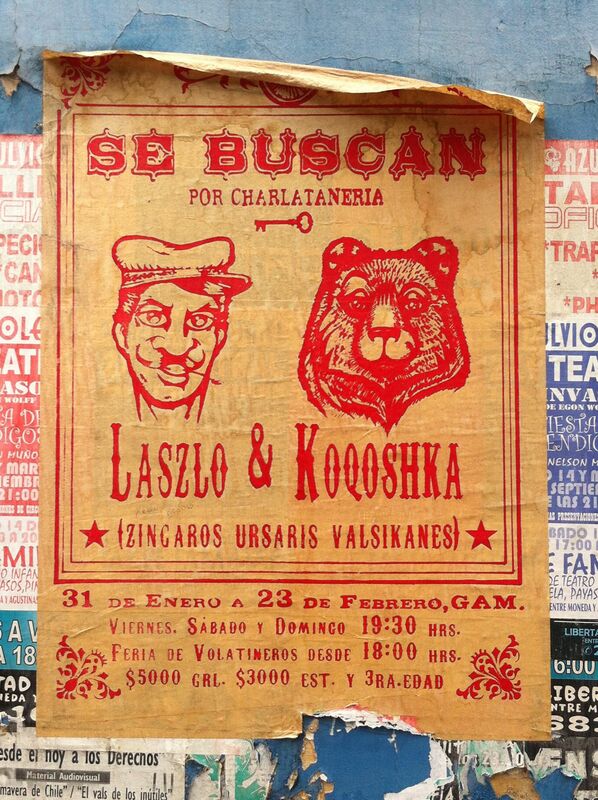 Finally, Laszlo and Koqoshka, who got left behind when the circus moved on, and are wanted for charlatanry. One wonders what particular crimes this offence entails, but Laszlo’s moustache certainly gives the impression that he might not be a chap to whom one would entrust the family silver. Koqoshka, as I have just now been reminded, bears a distinct resemblance to W.N. Herbert’s Murder Bear. But did he really get left behind? And. as this is a ‘Wanted’ poster, would any sane booty-hunter really wish to find Koqoshka and his ‘keeper’? Are picorocos anything like goose barnacles (percebes in Portugal, where I ate them, and, in my view, undeservedly, considered a delicacy there)? I have yet to try them, Charles, have only witnessed their sad little claws waving at me in the marketplace. But Chilean seafood is bigger and more bizarre than any I have met elsewhere. Just check out the varieties of piure, an example here: http://www.flickr.com/photos/sergiomajluf/1434468762/, or ‘locos’, also considered a great delicacy.